WHAT IS THE VALUE OF USING QUALITY CAR CARE PRODUCTS? The cost of automotive appearance care keeps going up - or does it? Let's look into what a bottle or jar of car wax really worth? What is the true cost of car wax, that is, the cost per application? Let's explore these questions. As the cost of new vehicles continues to increase, so does the potential cost of automotive appearance care. Car manufactures are consistently putting more money into paint appearance than any other single system on new vehicles. That's because most buyers put more emphasis on how the car looks than any other single factor. As paint technology improves, paint correction (car polish) and protection (car wax) products also improve. Car care companies invest millions of dollars each year in the research and development of new products that make your new or old car easier to maintain. Higher quality often means fewer applications, which saves you money. Many of the products on the market are hype and don't live up to their claims, but a few do. Here's one that passes a car wax review with flying colors! 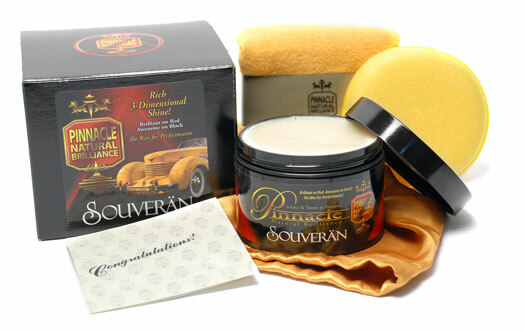 Pinnacle Souver�n Paste Wax is for enthusiasts who appreciate the deepest, wettest, and richest shine possible from their automobile's paint. 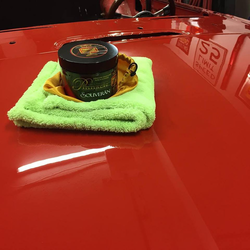 Formulated with pure �Ivory� Brazilian Carnauba and carefully selected natural oils, Souver�n dazzles with a liquid shine that shimmers across your body panels. This three-dimensional shine is breath taking. It forces you to park your automobile and walk away, just to so you can turn around and admire the look. A single jar can will treat even the largest truck or SUV up to 25 times. Wolfgang Deep Gloss Paint Sealant 3.0 is an outstanding paint sealant that offers durable, long-term paint protection using just a small amount of product. It will take less than 2 oz. of product to treat most vehicles! Once applied, WDGPS can last up to 6 months. That's half a year of protection - meaning you can spend more time driving and less time cleaning your ride! While quality car care products may cost more up front, they often provide better protection and last longer than bargain car care products. What you spend initially is a small price to pay for a shiny, well protected vehicle that requires less time and effort to maintain.